On a glorious day a late equaliser from Dan Drewett, who has recently returned from Shrivenham FC, earned Highworth Town a well deserved point against their visitors from Devon. In fact the much improved second half performance could have seen the home side take all 3 points had they not been somewhat wasteful in front of goal. Barnstaple were the better side in the first half and should have taken the lead on 20 minutes when they were awarded a penalty for what seemed a harsh handball decision. Steve Reed however missed the target from the 1`2 yard spot. It took only another couple of minutes before they did score however as Jack Langford slotted home from close range from a left wing cross. Mbunga had a shot blocked for the home side and visiting keeper Oliver did well to tip over a Jordan Young effort but half time arrived with no addition to the score. Highworth were much improved after the break and Oliver did well to save with his feet from Young before the same player chipped the keeper only for his effort to fractionally clear the crossbar as well. The equaliser came when Mbunga and Young combined on the right and Drewett shot high into the net from 8 yards. Barnstaple were now defending their point and after Oliver had pushed aside an effort from Young the ball fell to Jeffries whose shot appeared goal bound but struck Highworth's Morrison before being cleared. All in all 1-1 was probably fair result and certainly a decent point for the visitors in their fight against relegation. Our Match sponsor, Paul Mason, decided veteran Ross Adams was the home side's MoM. Our final game this season is again at home next Saturday when Fleet Town visit the Save On Tyres Stadium, 3,00 ko. The match will be followed by our Presentation Evening when individual awards are made to all of our teams. 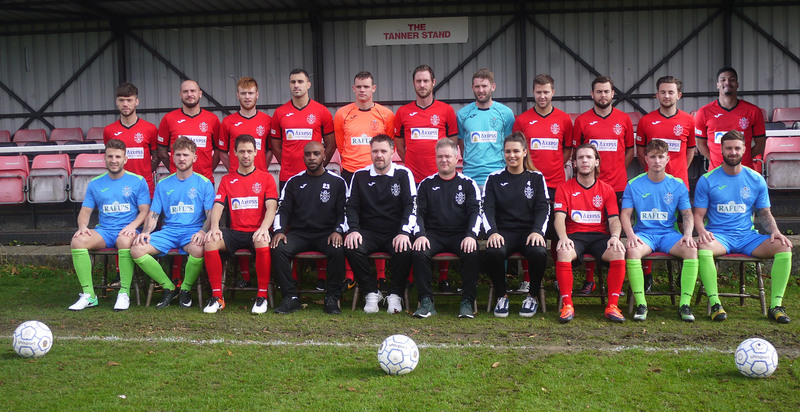 We also plan to open the new toilet and tea bar facilities on Saturday and have invited our numerous sponsors to the club to thank them for their continued support and show them what has been achieved inside and outside of the club over the last year.